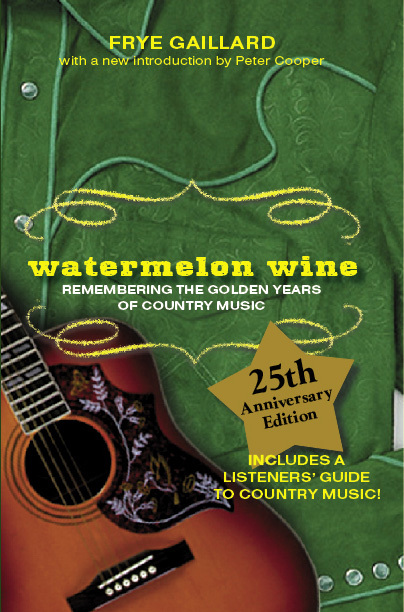 On Saturday, June 6, 2015, Frye Gaillard will read from his book, Watermelon Wine: Remembering the Golden Years of Country Music, at the Country Music Hall of Fame in Nashville. Gaillard will be part of a celebration of the life and legacy of the late Vince Matthews, a songwriter whose songs were recorded by Johnny Cash, Gordon Lightfoot, Crystal Gayle, Gene Watson, Charlie Pride, Waylon Jennings and others, and who once cut an album produced by Cash, Kris Kristofferson, Jack Clement, and Shel Silverstein. For an odd set of reasons, the album was never released . . . until now. Watermelon Wine is available from NewSouth Books or your favorite bookstore. In a recent features story, The Tennessean‘s Peter Cooper calls Frye Gaillard’s Watermelon Wine “the first great and inspiring book I ever read about Nashville music-makers.” Evidently, our NewSouth author found inspiration in his own work too, as he’s now writing songs and touring with his favorite Nashville singer-songwriters who perform them. The program is titled “Watermelon Wine and the Poetry of Southern Music.” Frye reads passages from from his book, sometimes in the company of NewSouth author Rheta Grimsley Johnson, who reads from her memoir about Hank Williams, Hank Hung the Moon. They are joined by Davis Raines, Pamela Jackson, and Anne E. DeChant. Raines and Jackson are both inspired by Gaillard’s gifts as a chronicler of Southern history, from the Civl War through the civil rights era. They credit him for his poetic lyrics, which describe human resilience in the face of social and economic hardship. Frye Gaillard and friends continue to take “Watermelon Wine and the Poetry of Southern Music” to venues throughout the Southeast, stopping at public libraries, coffee houses, and universities, too — Belmont University in Nashville, most recently. Always they play to an appreciate audience. Watermelon Wine and Hank Hung the Moon are available in print and ebook from NewSouth Books or your favorite bookstore.